Army Pfc. Lawrence N. Harris, Cpl. Judge C. Hellums and Pvt. Donald D. Owens were buried in a single casket Wednesday. Three World War II soldiers were finally laid to rest in Arlington National Cemetery Wednesday after almost seven decades missing in action. The men were buried together in a single casket with full military honors. Their remains were only recently identified through the efforts of the Joint POW/MIA Accounting Command (JPAC). Army Pfc. Lawrence N. Harris of Elkins, West Virginia., Cpl. Judge C. Hellums of Paris, Mississippi, and Pvt. Donald D. Owens of Cleveland were fighting with their unit, the 773rd Tank Destroyer Battalion, on October 9, 1944, during the final battle for control of the Parroy Forest in eastern France, according to the Department of Defense. All three were killed when their M-10 tank destroyer came under enemy fire. “Evidence at the time indicated the remains of the men had been destroyed in the attack and were neither recovered nor buried near the location," according to a Department of Defense press release. Then, in November 1946, a French soldier discovered the M-10 debris and human remains while working in the forest. The American Graves Registration Command (AGRC) took control of the remains, which were buried as unknowns in what is now the Ardennes American Cemetery in Belgium. Despite further searches for human remains on behalf of the AGRC, the Parroy Forest was thought to be void of human remains until 2003, when a French citizen exploring the area discovered Hellums’ identification bracelet and more human remains. A JPAC team working in Europe took control of the items in April 2006 and then returned to the site, recovering “more human remains, personal effects, and an identification tag for Owens,” according to the press release. Years of further research regarding the burials at Ardennes revealed a correlation between the new remains and three unknown soldiers. The bodies were disinterred in 2008. The soldiers were positively identified - using dental records, forensic tools and data from the Armed Forces DNA Identification Laboratory - on February 9, 2010. This identification, like many others, is part of a widespread effort by the Defense Prisoner of War and Mission Personnel Office. Today, more than 72,000 Americans still remain unaccounted for from World War II. The DPMO says on their website that this is simply an extension of the mottos “No one left behind,” “Fulfill their Trust” and “Keeping the Promise,” among others, having identified approximately 7,000 individuals since the end of WWII. The effort to properly recognize the sacrifices of the identified soldiers does not end there, however. 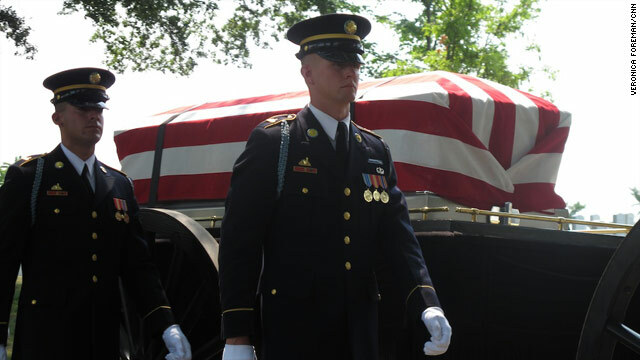 Organizations around the country have similarly dedicated themselves to ensuring a proper military funeral for every U.S. service member, from veterans to the recently identified. Bugles Across America, for example, was founded in 2000 by Tom Day after congressional legislation stated that all veterans had the right to at least two uniformed military personnel to fold the flag, and to have a recording of taps played. Day’s organization is committed to taking that promise even further. Volunteer bugle players in all 50 states offer a live rendition of the traditional burial song at every veteran's funeral. We won World War II. Soldiers kissed girls in Times Square. Bully for us, and bully for these heroes who have come home after decades. It is not our modern soldiers who have stopped winning wars: it is those civilians here who protest with "BRING-THEM-HOME" and "GET-OUT-OF-BLANK" signs who defeat us. Haven't these soldiers who died during WW2 already recieved their christian version of the mulim 72 virgin reward? The US government dropped it's long standing with The World Court as a founding member just days before invading the Iraqi peoples land, and is now 'above' international law, not nound by it, and immune from prosecution. American's ,who are caught doing the same things to Iraqi citizens that they were caught doing to American citizens before they chose the army over prison, do NOT face The Hague. They face their local county judge back home. (and JAG, who nine times out of tem drop the charges in exchange for re-enlisting) Fortunatly, the President of the United States, a self-admitted God-fearing man, understands that it is God who really judges American war criminals. Let's all hope that President Obama's God doesn't hold our entire nation accountable.